Stealing Signs: More Than A Dorm Decoration | Yavitch & Palmer Co., L.P.A. No college fraternity house would be complete without a green street sign that coincidentally matches the last name of one of the founding members or is mildly inappropriate, thus laugh inducing. At the very least, you might see an “under construction” sign hung on one of the bedroom or bathroom doors. Many of us have seen examples of this at one time or another, but have you ever wondered where those signs came from? 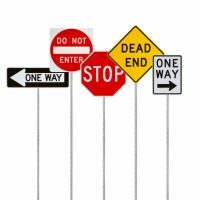 Is there a business who makes signs for novelty or is there a non-marked road somewhere with lost cars driving back and forth, wondering where to turn? At first glance, stealing road signs might seem like a victimless crime that’s all in good fun, but in reality, stealing signs can have major consequences. Signs are posted for a reason, and when they’re missing, the affected area can become confusing or dangerous for drivers and pedestrians. Street signs are public property, and theft of a street sign is a misdemeanor of the third degree in Ohio. However, if an accident occurs as a result of a sign that you stole, you may also be held liable for any damages or loss of life that were sustained. These charges can range from criminal mischief to felony manslaughter. The charges may also vary depending on the type of sign that was stolen. For instance, stealing stop signs, railroad crossings, pedestrian warnings or children-at-play signs may result in a harsher penalty, as the consequences of the missing signs could result in injury or death. Even if you see a street sign for sale at a flea market or garage sale, it is best to leave it alone. Despite the fact that you may not have stolen anything, purchase, possession and sale of road signs is illegal. In fact, the mere act of simply owning a stop sign in Ohio is punishable by fines and incarceration. College can prove to be a very interesting time for young people. On one hand, the rebellious and fun-loving streak could be at it’s highest, but on the other hand, making a few poor decisions and being convicted of a crime can seriously impede one’s future. That’s why, if you or your student is arrested and charged for stealing a sign or having involvement in any other type of criminal mischief, you need an experienced, professional Columbus criminal defense attorney from Yavitch & Palmer. We’ll listen to your side of the story and look over every aspect of your case to get your charges minimized or dismissed entirely. Call Yavitch & Palmer today at 614-224-6142, or make an appointment at our downtown Columbus office using our online contact form.